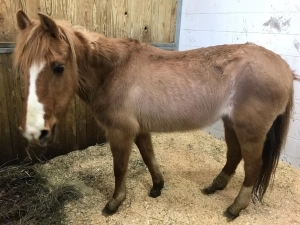 This large pony mare came to MHARF from a late March 2019 Fillmore County humane case. She is currently experiencing some hind quarter weakness and is receiving veterinary care. We do have an adoptive home as a companion horse set up for her as soon as she is ready.